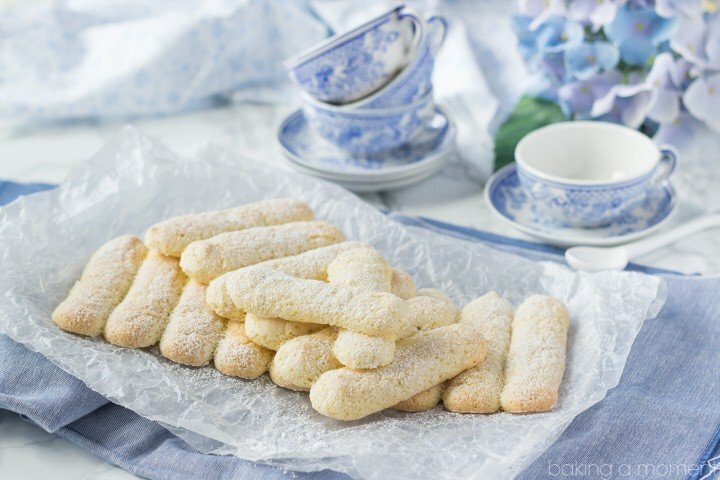 Have you ever wondered how to make homemade ladyfingers? It’s really very simple! If you can separate eggs and pipe a straight line, you’re just moments away from these light, sweet, and delicate little cakes. They’re perfect for your next tiramisu or Charlotte recipe! Can you believe the week is half over already? Where did it go? Can someone please tell me? My kids have been in school for three weeks now but they’ve yet to have an actual 5-day week. And I think they won’t for at least a few weeks more. So many fall holidays! And we haven’t even gotten close to the major ones yet (I can’t wait!). So, I’m a little behind this week because of the extended weekend and all the festivities that went along with it. I actually made and shot these little lovelies last week, but I wasn’t completely happy with them, and wanted an extra day to tweak and test. I’m glad I did because the revised recipe is easy as pie and practically fool-proof. I’m telling you, if you can separate and whip eggs, then homemade ladyfingers are nothing to fear. There is no need for you to buy those strange hard things in a cardboard box. I don’t know what those have in them, but these are little more than fresh eggs, sugar, and a little flour. I whipped them up in less than an hour, and they are light as air, sponge-y, sweet, and delicate as can be. Room temperature eggs are best for this recipe, but I used cold from the fridge and it still worked just fine. Crack the eggs gently so as not to break the yolk. If any yolk gets into the white, the whites won’t whip up properly. I like to open the egg into my hand so I can gently pull the white away with my fingers. The sharp, jagged edges of the shell make me nervous! Add the sugar to the whites slowly. When they are starting to look soft and more white and opaque, you can start adding it in, in a very slow stream, so that it has time to dissolve fully but doesn’t deflate or knock the air out of the fluffy whites. Whip the bejeezus out of the yolks and sugar. The color should change dramatically from deep, orange-y yellow, to a very pale canary color. They should be really thick too, and fall from the beater in a long ribbon. I flavored mine with vanilla bean paste, but I think they’d be lovely with orange blossom water or lemon zest as well. Fold the whites into the yolks carefully. It’s ok if the batter looks a little streaky, because it’s going to get lots more folds when you add the flour. I found it helpful to make myself a little guide before I started piping. I just measured and marked lines, 3-inches apart, on a sheet of parchment paper. Then I marked perpendicular lines, 1-inch apart. You only have to do this one time! Keep that sheet as a guide and slip it between the sheet pan and the parchment you actually pipe the ladyfingers onto. When you are done piping, slip the guide sheet out before popping the ladyfingers into the oven, and you can use it over and over again. 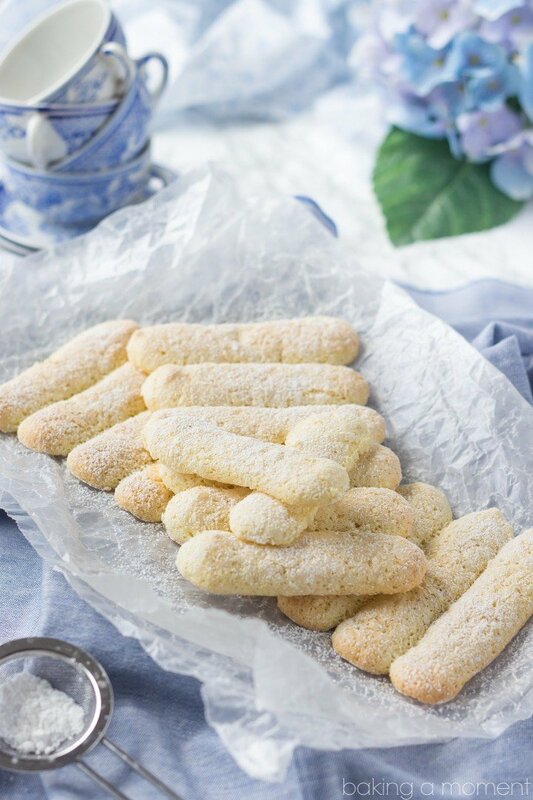 You’ll notice that the powdered sugar melts into the surface of the unbaked ladyfingers pretty quickly. That’s ok! It’s still useful because it creates a nice crackly crust on the surface. You can dust them a second time for looks, once they are baked and cooled. You can make them ahead! I double wrapped mine, loosely, in plastic bags and then popped them in the freezer. They’ll keep in the fridge for several days too! I hope you’ll give this recipe a try! It’s as simple as a sponge cake, really, and such a fun one to make. So versatile too! In case you are wondering, here is the kind of pastry bag I like to use, with this tip. And I buy my parchment sheets here. These are the baking sheets I have (and I love them!). 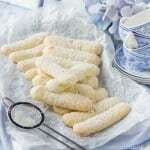 Have you ever wondered how to make homemade ladyfingers? It's really very simple! If you can separate eggs and pipe a straight line, you're just moments away from these light, sweet, and delicate little cakes. They're perfect for your next tiramisu or Charlotte recipe! Separate the eggs, placing the yolks in a large bowl and the whites in a slightly smaller one. Whip the egg whites on medium high speed, until fluffy. Add 1/4 cup of the sugar, in a slow and steady stream, while whipping. Continue to whip until the whites hold stiff peaks. Set aside. Whip the egg yolks with the remaining sugar, until pale and thick. Use a silicone spatula to gently fold in the whipped whites, taking care not to deflate all the air you have so carefully incorporated. Sift the flour over the mixture. Add the salt, and carefully fold once more, until well incorporated. Dust with powdered sugar and bake for 14-16 minutes, or until just beginning to turn golden around the edges. Bring on the tiramisu because these are just begging to be dunked! Thanks for sharing Allie! Yes!!! So glad you like them, Tori. Thanks for the awesome feedback! Opened Instagram in my bed this morning and these beauties popped up on the screen. Goodbye forever, store-bought, plastic-wrapped lady fingers. Awesome! So happy you like it Beth! Have a great week, sweetie! Love this so much! Glad you did an extra day to reshoot. I came out beautiful, as always! And ladyfingers? Always a favorite in our home. OMG my husband’s favorite dessert EVER is tiramisu! I KNOW he would love it evem more with fresh, fabulous homemade lady fingers! These are amazing, Allie! Love the photography (like always), those tea cups are so cute!! Pinned! Cheers, girlie! Allie, these look so light and delicious (way better than the prepackaged ones). I love that you can freeze them as well 🙂 We haven’t had a full week of school yet either, and that’s not going to happen until the beginning of October! Yep, same here! This week they’re off on Wednesday. Aye! I just wish we could get into a good routine. Hang in there, girl! And thank you for the sweet comment! Thanks Medha! That’s exactly what they are. Great description! That sounds amazing! Love the idea of a tropical tiramisu. That’s so you! Lovely little lady fingers my dear. Do I see a delicious tiramisu in your future??? I see many many tiramisus in my future with these beauties!!! Holla! Thanks so much Jocelyn! WOW! These are so clever! One of those things you just buy on autopilot without thinking, hey could I make that from scratch? I’m excited AND my husbands favourite dessert is tiramisu!!! I’ve never made homemade lady fingers but I LOVE the idea! It looks so light delicate and delicious! They are super light and spongy. Loved the vanilla flavor too. Thanks so much Jessica! My mind is officially blown! I never even thought to make lady fingers at home before. This is awesome! And love all your detailed tips! 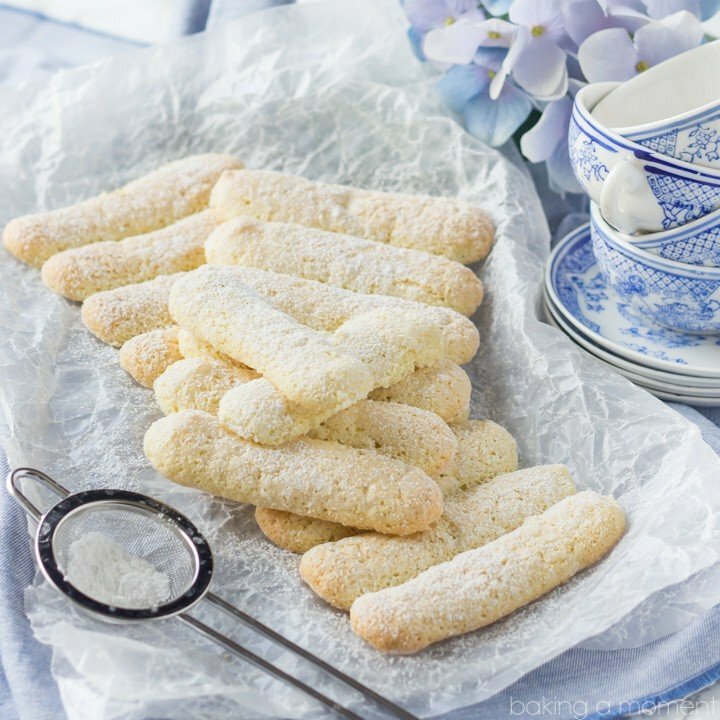 Oh wow, I adore Ladyfingers, but have never made them before. They kind of scare me actually!! These look so good I may have to have a go! Easy as pie and practically fool-proof? this is what I need! love these ladyfingers, Allie!!! Thanks Alice! They really are a snap! Oh this is so cool! I don’t think I would have ever thought to make ladyfingers myself but now I really want to! Such pretty photos too Allie!! I’ve made lady fingers twice and they really were easy! I love how you’ve broken everything down here and yours look just perfect (of course!). 🙂 Pinned! Aw thank you Marcie! I should have guessed that you already knew how, you’re such a rockstar in the kitchen! I never attempted making my own ladyfingers but that is gonna change ASAP today because these are calling my name. I had so much fun with them! Thanks so much Nicole! How talented are you, making your own lady fingers!? This is totally genius and I’m loving them! Pinned! Oh it’s only three inches! I think you’ve got it in you 😉 Thanks so much Kayle! Wow I never even thought of making my own lady fingers. They are so hard to find at the stores this will be exceptionally handy! I’m always on the hunt for good lady fingers because they’re not only great in tiramisu – they’re also delicious on their own. They taste especially good with a double espresso! Store bought lady fingers simply aren’t as good as the homemade ones. Wow these look wonderful Allie. Thank you so much for posting them. I’ve been wanting to make tiramisu but could not find ladyfingers in any of the grocery stores where I live. So I checked on line and found you. I’m making them today. Thank you so much. No such as ‘former pastry chef’ when it comes to you!! 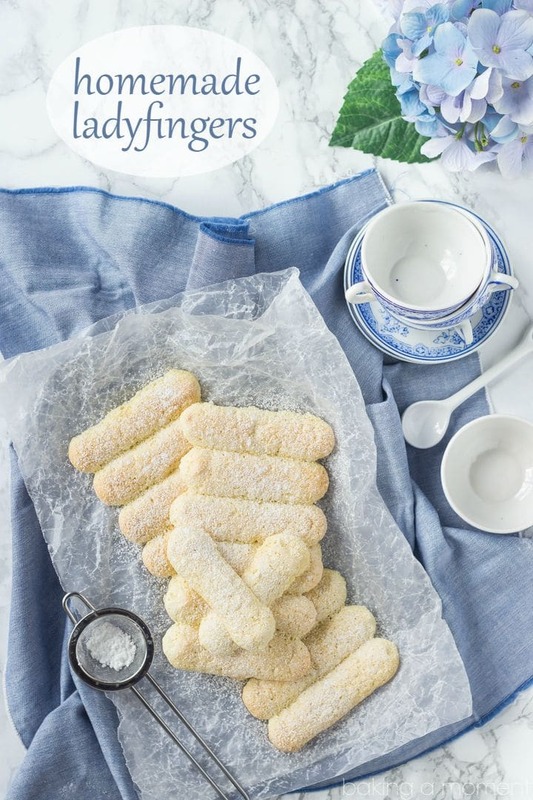 Ive been looking for an old-fashioned ladyfinger recipe with the crispy exterior and these are it – and soooo easy to make. Of course mine are not as pretty as yours and they are just a bit too moist for me–maybe I made the 3″ line too thick?? At last someone knew what I was talking about. I plan to make a trifle and I sure hope there are enough left until tomorrow and the cook didn’t ‘test them’ all up! Great to find you – many thanks – I will surely stay tuned. to soak up the coffee and not fall apart. Hey Teresa! I think part of your comment may have gotten cut off. What was your question? I just made these and I will NEVER buy Ladyfingers again!! I made 2 batches…one topped with powdered sugar and the other with granulated sugar, to resemble the packaged kind of cookie. I can’t decide which ones are better!! You made my night…I’m so glad I found your recipe…I followed it to a “T” and I am in love! When they cool down, I’m making my Tiramisu!! Thank you for posting a beautiful recipe!! My pleasure Francesca! I’m so thrilled that you’re happy with them. Thanks for the awesome feedback! Not really sure about other recipes Alma- this was what I used and I was very happy with the result. Good luck and I hope you enjoy! Hi Robin! The recipe calls for 3 whole eggs plus 1 egg white. Hope that helps! I’m a little confused by this recipe and want to make sure I’m doing it right. It calls for three whole eggs and one egg white, but the recipe only refers to egg whites and yolks. Am I separating the three whole eggs? And if so, am I using just the yolks or the yolks AND the whites? Hey Amy! Yes the recipe calls for 3 whole eggs plus one extra white. It’s explained further in step 2 of the directions: “Separate the eggs, placing the yolks in a large bowl and the whites in a slightly smaller one.” You are using both the whites and the yolks separately. Step 3 gives instructions on what to do with the whites, and step 4 gives instructions on what to do with the yolks. Thank you Alli for this awesome recipe!! It has been probably close to 20 years since I last made ladyfingers, at a retail bakery. Your recipe is just about identical to what I remember, except back then it was a two-person job, with someone ‘shooting in’ the flour to the egg mixture and the other person was folding, in a 20 quart mixing bowl, 🙂 Now I am a pastry baker for a private lodge and I want to make tiramisu for the first time ever. Found your tiramisu recipe, realized I needed to make my own ladyfingers so I have conquered step one! Made 96 of these babies today! Bought Marsala on the way home and the mascarpone cheese is due to be delivered tomorrow. I know I need to assemble it the day before planning to serve so it can develop. So looking forward to the deliciousness! Can you use regular salt instead of Kosher salt? Do you mean table salt? Table salt is much saltier so if you make that substitution you will probably want to use less. No, you use 3 yolks and 4 whites.